Clarke County Hospital's Pharmacy Department monitors patient medication therapy to provide the correct dose and drug for patients based on their age, weight, diagnoses, other medications and gender. The pharmacy is responsible for all medications in the hospital and dispenses approximately 80,000 doses annually. Medication safety is important to Clarke County Hospital. We have implemented a computer system to aid in identifying medication interactions. With the help of this system, we verify accuracy of patient medications through the use of bar codes on the patient's wristband and the medication. This service gives additional safety to medications administered to hospitalized patients. Patients with outpatient therapy needs are often able to stay closer to home through our outpatient infusion services. The Pharmacy provides medications for this important service in close partnership with our Outpatient Services Department. In addition to medication, the pharmacy provides information on medication therapy and disease state management to patients, physicians and hospital staff. This includes medication information sheets, research of current therapy trends and creating guidelines for management of specific diseases. Our pharmacist is board certified in geriatric pharmacy, the use of medications in the elderly. 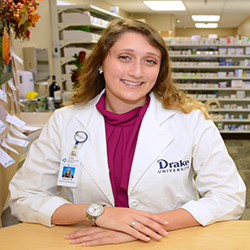 Clarke County Hospital is proud to serve as a site for Drake University student pharmacists to experience the practice of pharmacy in a rural setting.